Most of these things didn’t come to fruition, or if they did, they were short-lived. While I was hoping for some rad hallucinations to be able to share, the most I got was thinking that a log on the side of the trail was a squirrel and that the stars in the otherwise dark night sky was a headlamp shining. I really thought I would get bored or at least lonely during the race, but was surprised to find that the loneliest time of the race was in the first twenty miles. I felt like a 6th grader on the first day of Middle School. I built it up in my head that everyone had so much more experience than I did and didn’t want to talk with other runners around me because I was sure they could sense I was some sort of ultrarunning impostor who got in on a last-chance Golden Ticket and really wasn’t cut out for a 100-mile race. I realize now, everyone had their own nerves and the altitude of 7000-8000’ wasn’t really conducive to exerting energy on conversation. After the jumble of runners from the start line thinned and the trail opened up to some double track, the camaraderie improved and moved the day a little quicker. Along these same lines, I thought that I would be feeling mentally negative much later in the race, but was surprised to find that the first 25 miles up to the first crew point at Duncan Canyon were the most difficult. The early wake-up and small breakfast (I have trouble eating with pre-race nerves) put me into a funk that I worried would last longer into the day. It took a few aid stations to realize I was still right on track with where I was supposed to be, but I focused additional energy trying to get solid food into my stomach to alleviate some of the mental negativity that was likely a result of altitude and blood sugar issues. It’s hard to say if my mood turned around due to decreasing altitude or the emotional boost of seeing my crew, but I’m sharing this experience because I think many runners get caught up in feeling that their whole day is ruined if the race doesn’t start off feeling good. In reality, if you trust in your physical training and do what you can to turn it around, this is truly not the case. When I say that I thought I would experience much more self-doubt during the race, I mean it in the sense of asking my body to do something it has never done before. Each race distance is completely different and provides new stimulus to your mind and body. I thought that I would experience much more doubt that I would be able to finish the race. I had prepped my crew not to let me quit unless I was experiencing something that would injure me past repair. In reality, I found that by setting small goals and having low expectations of how I should feel or what pace I should be running, it became much easier to cover the distance and shove the self-doubt out of my mind. A couple things helped me deal with this increase of distance and self-doubt that I could cover the distance. First, I started acting like I was really bad at math and “tricking” myself into how much distance was left. 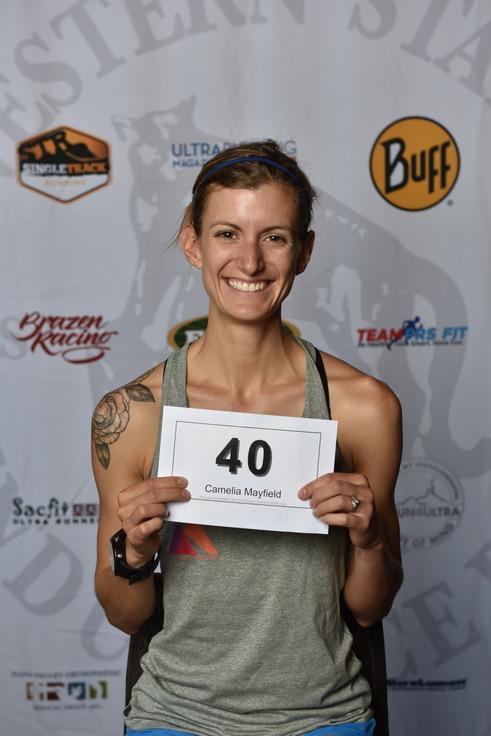 62 miles into a 100-mile race is only the halfway point in terms of mental fatigue. The last 15 miles is really like the last quarter of the race. Basically, I told myself I had a lot farther to go, so that when I actually covered the distance, it seemed like it went really quickly. Along these same lines, it helped to look at past splits from the same race of actual runners to have an idea of what sections of the course are particularly slow and when runners tended to fall off pace. Before the race I looked at what time would be my goal time to come through aid stations and what would be the cutoff time. Probably the most surprising emotional and mental aspect of this race was the moment when I finally finished. Leading up to the race, I had visualized myself finally getting to the Placer High School Track. I was certain I would be crying and immediately turn to my fiance in a cliché move moment where we both looked at each other knowing I had given it my all and finally finished a grueling race. In actuality, I felt completely spent. 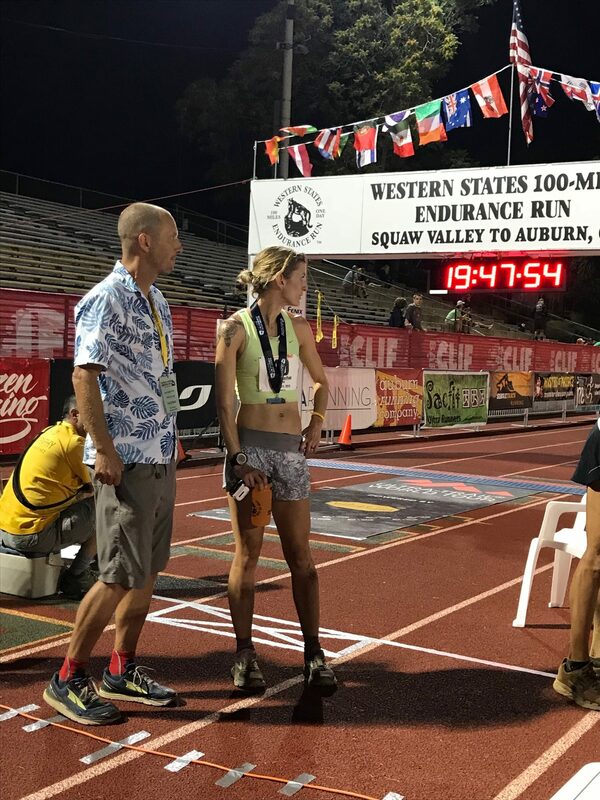 I had no emotion left to expend on tears of happiness, as I had just spent nearly 20 hours fixated on pace, terrain, fueling, moving. Don’t get me wrong; I felt an immense gratitude for the place I had come to stand and each step that had gotten me there, shared with pacers and crew. But this gratitude was coupled with contentment. Any superfluous words or tears in that moment would somehow disrupt the stillness that had finally been granted. Yes, I was happy, but there was no show of extra emotion aside from the warm hugs of my family. Watching Jim Walmsley’s historic finish, I recognize a sense of the same exhaustion and contentment. He walks across the finish line and after a few moments of processing the previous 100 miles, he throws his handheld bottle in the air. It is almost a mix of celebration and relief of no longer having to carry that extra pound of weight in his hand. This simple gesture is such a contrast of gold-medal finishes at the Olympics, full of fanfare and extravagance. It’s simply the end of a day of really hard work for him and the relief that comes with that. If you haven’t watched it; I encourage you to. This blog post has some concrete ways to deal with the emotional and mental fatigue that come from running much longer than you ever have before. Coming soon, I’ll expand on my tools I use in training and prior to races that have helped me mentally and emotionally prepare for ultra-marathons. Feel free to reach out to the myself and the other coaches at Trails and Tarmac if you have more specific questions related to this blog.